With our diabetes-management-software-SiDiary you can easily import data from your Medisana VitaDock Online App and use lots of advantages of statistical analysis; trend analysis and graphics to improve your therapy together with your doctor. This picture shows the data transfer from an Medisana VitaDock Online export file. 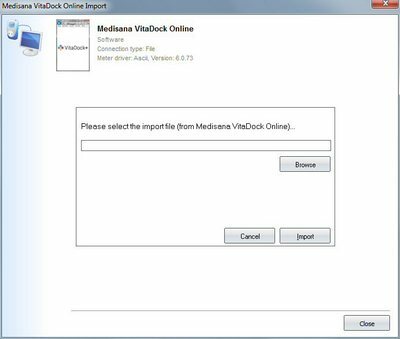 For the data import from Medisana VitaDock Online just create an export file with the app and import this file into SiDiary. At this page you'll find more details from the manufacturer Medisana.